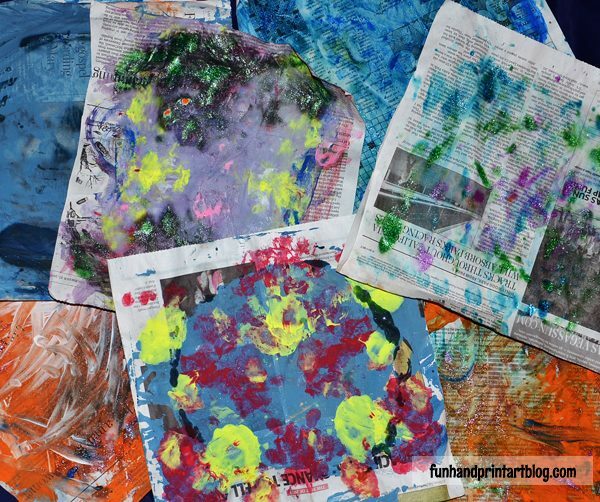 If you’re looking for a boredom buster, invite the kids to paint newspaper and then turn it into artwork! 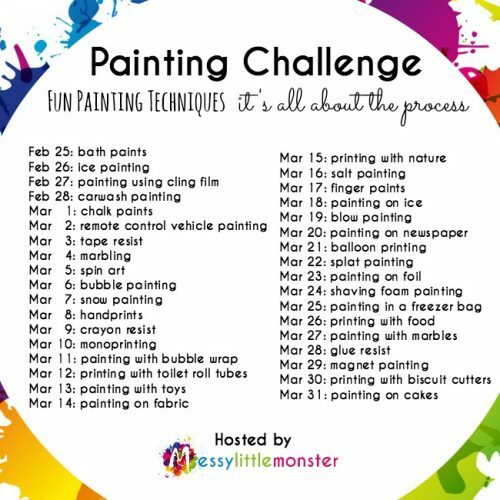 This post is also part of a series that we are excited to have joined titled the Painting Challenge which is hosted by Messy Little Monster. It’s all about process art and different painting techniques. I’m blown away by the ones that have already been shared. 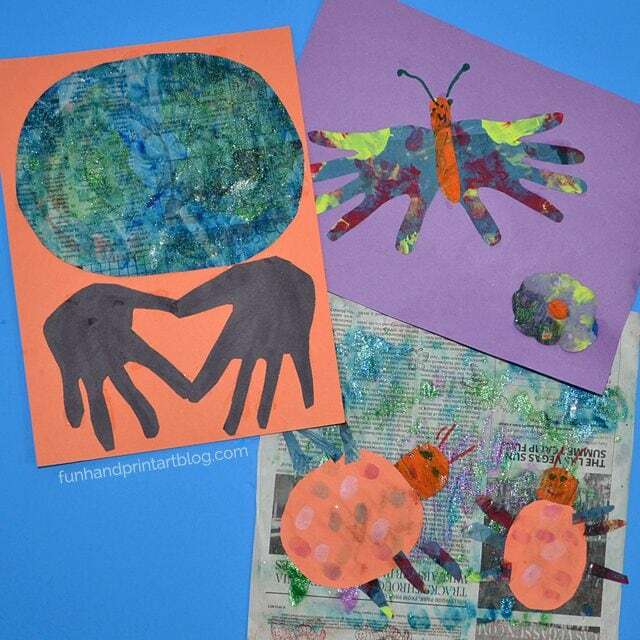 We choose to do painted newspaper art for kids. 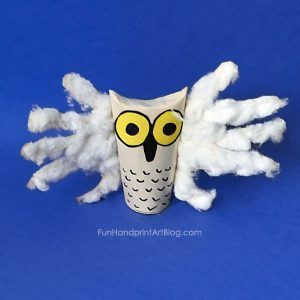 A few years ago we made this handprint owl newspaper art that is still a favorite to this day so was excited to see what we would come up with this time around. 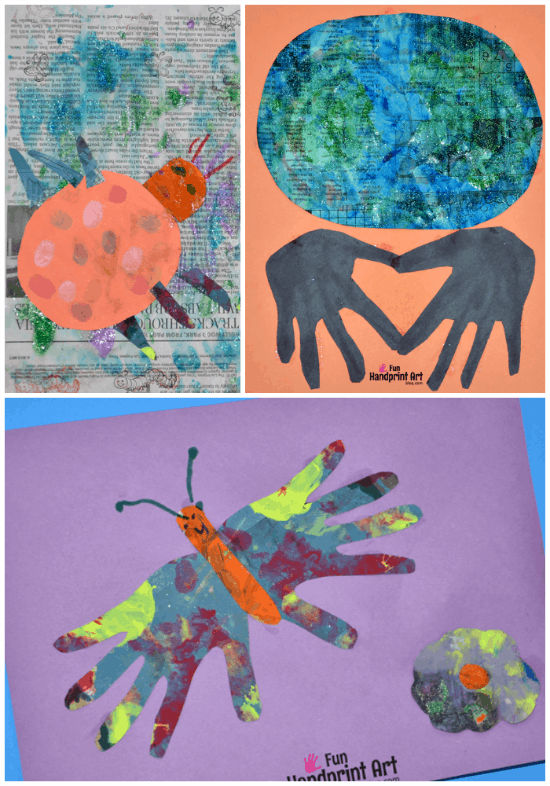 We made an Earth Day handprint crafts, ladybugs, and a butterfly! We cut a section of the newspaper along the creases so the kids could have a good sized square to paint. Let them explore painting them however they’d like. Little Sister did most of these and tried many different techniques. She loves to mix the paint to see what new colors she can make. She used a paintbrush to do this part. 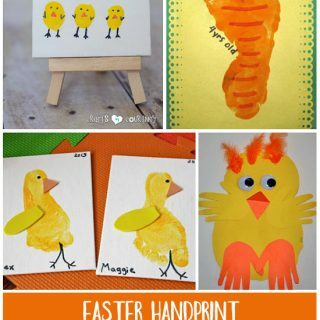 You could use washable kids paint or watercolors and even add glitter paint like we did. 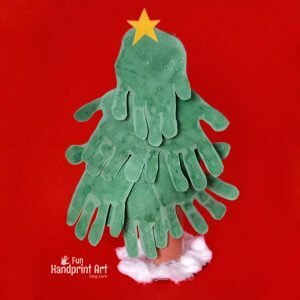 Several are made by fingerpainting. The paper that has red, yellow, and blue was painted slightly different than the rest. 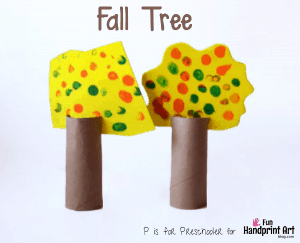 We put blobs of the 3 primary colors on one side of one of the plainer painted papers. Then I folded it in half and asked Little Sister to rub it and then open it back up. Of course she loved see what it looked like and how it mixed together to create orange, green, and purple in some areas. We let the finished pieces dry overnight. 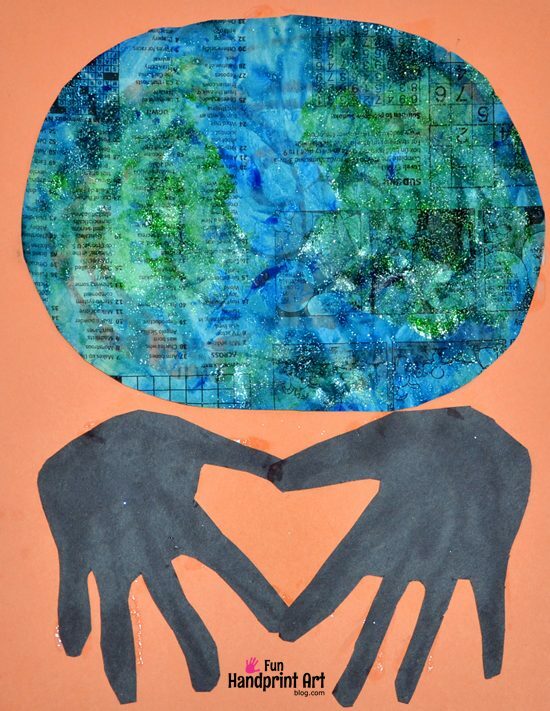 Inspired by the symmetry of the folded blob painted newspaper, I folded it back in half and traced her hand to turn it into a butterfly. To do this you will want to have the bottom edge of the palm along the folded part and then trace the hand. 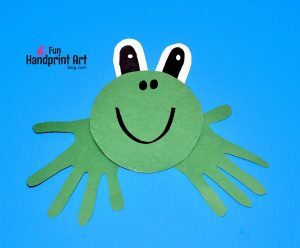 Cut around the hand outline except the folded part. When they open it back up, they will have colorful wings for their butterfly! The body is cut from one of the orange painted papers and the flower is cut from the more purpley paper. All the pieces are glued onto a purple sheet of construction paper. Little Sister drew the face and antennae on with markers. 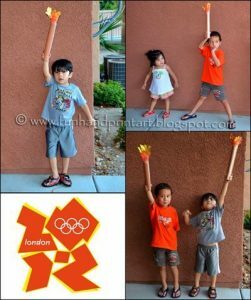 Then we turned them into artwork! Little Sister was set on making ladybugs (like usual…he, he) and grabbed a sheet of orange construction paper and asked me to cut ladybugs for her. 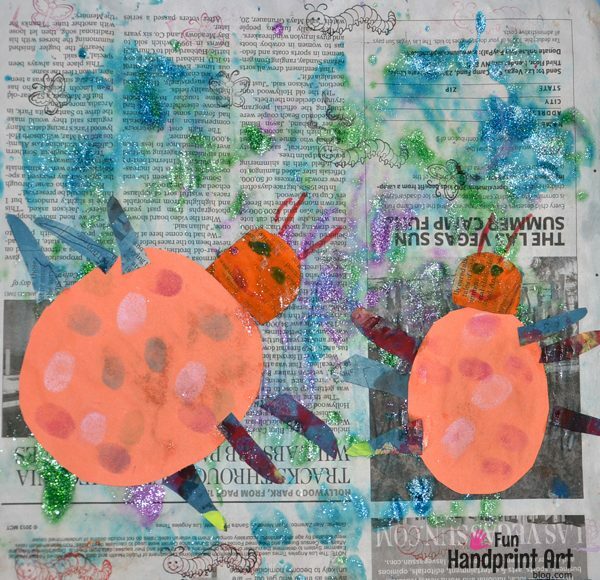 She chose the paper with all the different glitter paint splotches on it to glue her ladybugs on. The head and legs are created with cut pieces from a few of the other painted newspaper pieces and then glued them into place. 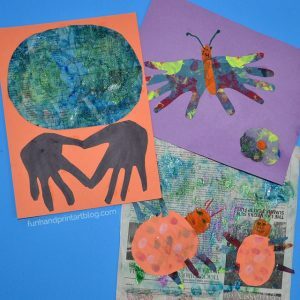 She drew the eyes, mouth, and antennae with markers and used ink pads to create the ladybug’s spots in all different colors. 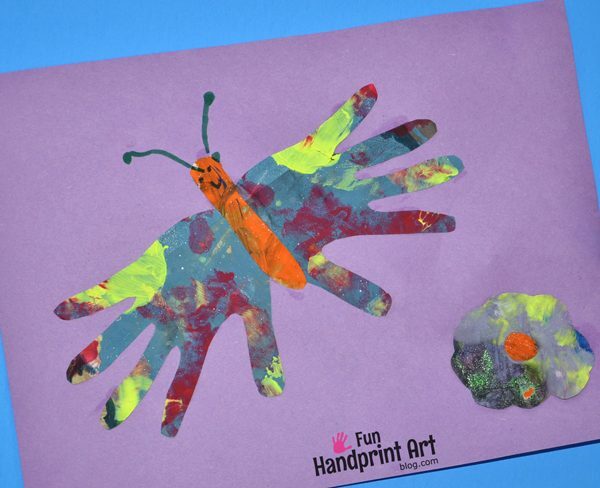 I also gave her a butterfly and caterpillar stamp to add on her artwork. 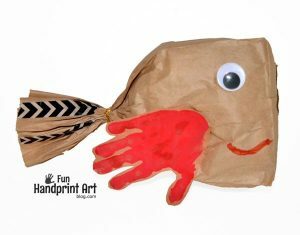 This handprint Earth Day craft was made by Big Brother. 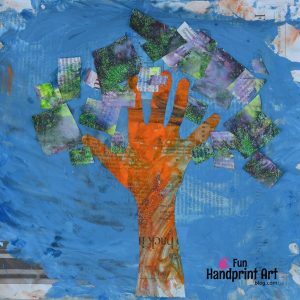 He painted a newspaper square with blue paint and green glitter paint. I cut it into a circle shape while he cut the hand outlines that we traced on to black construction paper. 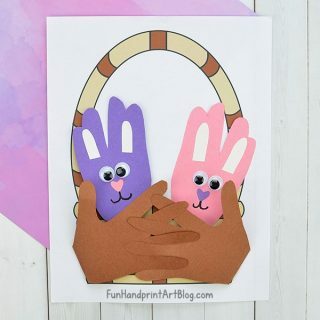 The Earth is glued to the top half of orange construction paper while the hands are glued on the bottom half with the fingers pointed down and forming a heart shape. 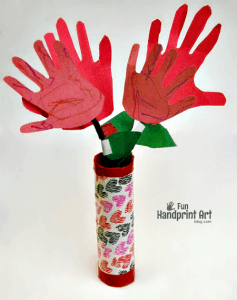 This was inspired by a similar Earth Day craft we made together a few years ago. Ready to see more fun painting techniques? 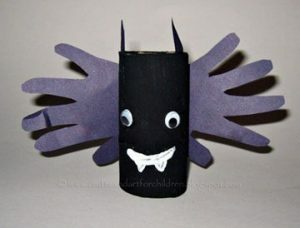 Head over to Messy Little Monster to see sneak peeks and get the links to all the posts! You and the kids have loads of great ideas. I love the butterfly. Thanks Louise! So do you 🙂 Love seeing what you come up with next!